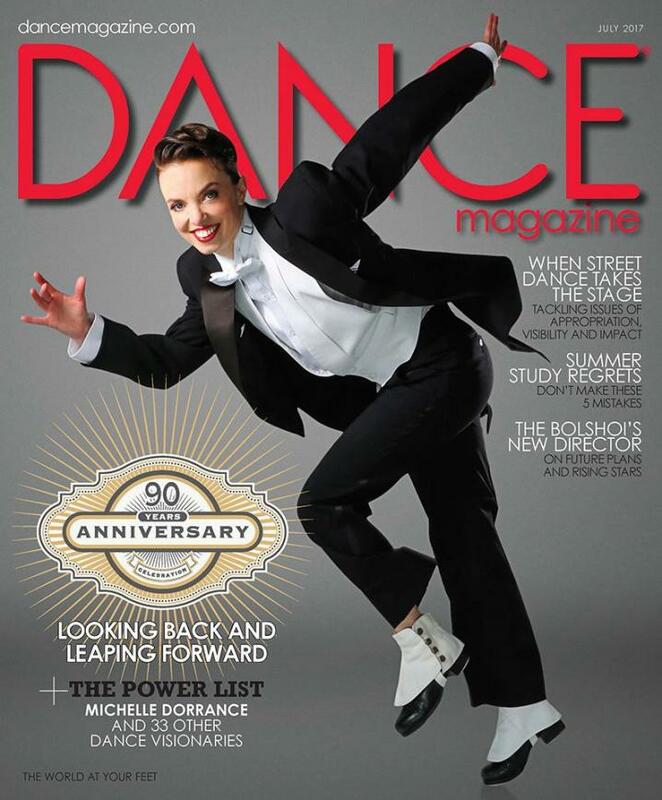 For Dance Magazine's 90th anniversary issue, we wanted to celebrate the movers, shakers and change makers who are having the biggest impact on our field right now. There were so many to choose from! But with the help of dozens of writers, artists and administrators working in dance, the Dance Magazine staff whittled the list down to those we felt are making the most difference right now. Michelle Dorrance has just returned from Stockholm, where she was teaching without pause for much of the previous week. Before that, she had a pit stop in New York, a quick gig in Los Angeles and performances in New Hampshire. "It was relentless," she says in a huskier-than-usual voice, owing to a cold. The breakneck itinerary is an apt illustration of what an in-demand artist she has become, especially since receiving a prestigious MacArthur Fellowship in 2015. While that recognition may have introduced her to a new audience, dance fans and critics were already swooning for her sophisticated musicality, thrilling ensemble arrangements and layered choreography that hits a wide range of emotional notes. Part of what makes Dorrance, 37, such an influential figure is precisely this resistance to being singled out. One of the ways she deals with the attention is by redirecting it to her community. She constantly name-checks the people who influence her—from her parents to her mentor in North Carolina, Gene Medler, to heroes like Dianne Walker and Brenda Bufalino, collaborators like Derick K. Grant and Dormeshia Sumbry-Edwards, the members of her company, Dorrance Dance, and contemporaries like Chicago dancer Jumaane Taylor, who, she gushes, "is at the top of his game." You can tell she's genuine by the way her voice clears and perks up when talking about her colleagues, as though celebrating others is chasing away the cold. Collaboration and tradition are the pillars of Dorrance's art, but it doesn't stop there. "She's also an innovator," says Linda Shelton, the executive director of New York City's Joyce Theater, one of several venues that have nurtured Dorrance. "She's honoring the traditions of tap, but she's also making it relevant to a new generation." A prime example of her artistic values can be found in The Blues Project, which Shelton brought to The Joyce in 2015 for three performances and again in 2016 for two weeks, a rare feat that also speaks to Dorrance's popularity with audiences. Dorrance co-created the work with musician Toshi Reagon plus Grant and Sumbry-Edwards, weaving together nods to the past with inventive configurations and invigorating energy. Another acclaimed work, ETM: The Initial Approach and its follow-up, ETM: Double Down, cleverly merged tap and technology ("ETM" stands for "electronic tap music"), and was created with longtime company member Nicholas Van Young, who praises Dorrance for her focus and openness. "Michelle is very clear with her intentions," he says, "yet in collaboration she always makes you feel free to explore, develop, share and express." The mutual respect is clear. "We're loyal to her and she's loyal to us," says rehearsal director Elizabeth Burke, who has known Dorrance since age 6 and danced with her company since it was founded in 2011. "She has an uncanny ability to bring different people together with different skill sets and energies and make it feel like a cohesive art that makes sense." Burke recalls the early days of Dorrance Dance, rehearsing at night in various studios on the Lower East Side and touring in an old minivan with mismatched doors. By that time, Dorrance was already a familiar face on the tap scene, having worked with Glover and performed with STOMP for years. Starting a company allowed her to experiment and work with dancers she admired, though its speedy path to success has surprised everyone involved. For all her humility, Dorrance has expanded the possibilities of tap in significant ways. Moving forward, she's mindful of keeping tap history at the center of her work. "I want to further refine my vision so my influence is rooted in the integrity of our form," she says. And she's eager to refocus on her own dancing, which she feels has been neglected due to the administrative duties of the past few years. But she's not feeling rushed. "What I love about tap dancers is that they die in their 90s with their shoes on," she says. "We're a breed of dancers that doesn't retire with age."